From pizza to coffee, industrial 6-Axis robotic arms are now appearing outside the factory lines. What is a 6-Axis Robotic Arm? 6-Axis robotic arms are the staple of many industrial factory lines today. They are used for dangerous, repetitive, high precision tasks such as welding and heavy lifting. Their name comes from the design and mobility of the robotic arm itself, referred to as the 6 degrees of freedom. Axis 3 —upper arm to raise & lower. Axis 6 —wrist twisting circular motion. 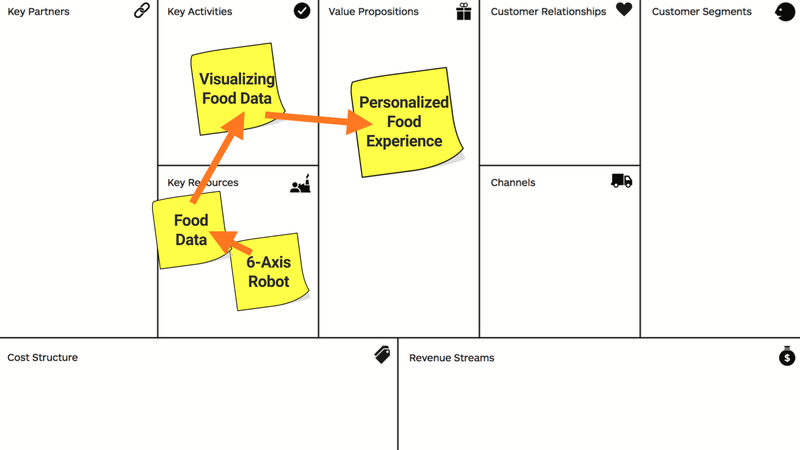 The food and beverage industries are ripe for disruption. Entrepreneurial minded people are realizing they can drive down the cost structure over time with automation using customized 6-Axis robots. Rent decreases because less physical space is needed. Errors decrease which avoids costly human mistakes. Operations increase slightly because you need to maintain the robot. Equipment costs greatly increase at first, but depreciate over time. These 6-Axis robots throw off enormous amounts of data, which can be packaged to provide value to both the business itself and the end customer. Robots throw off data about the orders and cycle time. This data can be packaged to benefit the business to run more efficiently. This data can be packaged to provide more insights to the end customer. The end customer may be willing to pay extra for these insights over time. This strategy of leveraging 6-Axis robots outside of the factory line is not in the far distant future. It is already happening and some have likened the 6-Axis robot as the face of the Third Industrial Revolution. Zume is a startup in Mountain View CA that’s automating the repetitive tasks of pizza delivery. They are investing the cost savings of manual labor and rent into high quality ingredients. 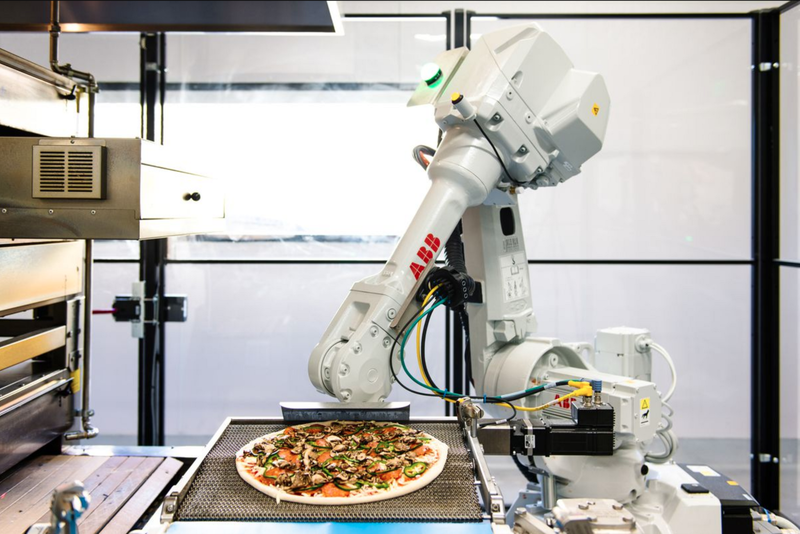 Zume has customized an industrial, 6-Axis ABB model robotic arm for placing pizzas into an oven. Speaking of repetitive dangerous tasks, how many times does an employee take pizzas in and out of a 600 degree oven each day? Zume recently raised $48 million to scale their operation across the Bay Area. They can deliver over 300 pizzas an hour, have a series of robots working in unison and pay their human employees above minimum wage. The founders have stated they want to expand to other types of food and become the Amazon for Food. CafeX is a startup that opened an automated coffee robot pod at the AMC Metreon in San Francisco, CA earlier this year. In a similar theme, they are automating the repetitive tasks of baristas to invest human capital into the more creative aspects of coffee. I decided to give CafeX a try and ordered my flat white from the CafeX iOS App while on Bart. When I arrived at the pod, I typed in my code to get my drink (shown above). I was surprised to learn that people were working near the pod. Turns out that CafeX has former baristas who were burnt out on performing repetitive tasks. CafeX uses a Mitsubishi RV 4FL 6-Axis with a custom end effector. It can serve from 100–120 drinks per hour. CafeX founder, Henry Hu is a Peter Thiel Fellow looking at ways to disrupt the cafe industry. He raised $5 million from Thiel and others to get CafeX up and running. 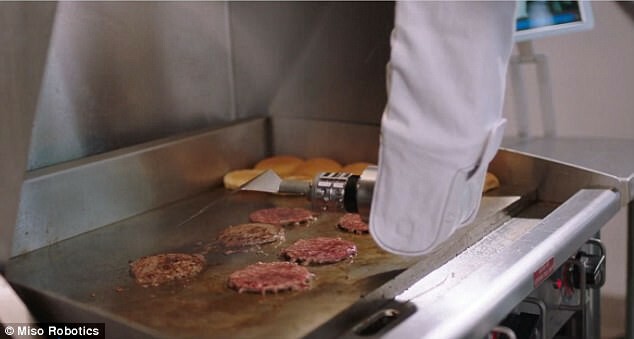 Flippy is a burger flipping robot created by Miso Robotics. They’ve coupled a Miso Robotics 6-Axis robot with advanced computer imaging and AI to cook burgers to different levels of done. The premise behind Flippy is to augment people in burger restaurants and work beside them. Flippy is now featured at Caliburger in Pasadena, CA and has bigger plans across the restaurant chain. Once the AI can learn burgers, it’s not hard to imagine how it could learn other types of food which are prepared on the grill. The latest incarnation of Flippy (pictured above) has a traditional spatula as a custom end effector. Pioneers in restaurant automation are betting that the down time of a machine such as Flippy will far outweigh the costs of errors and accidents in manual labor. MakrShakr came out of MIT’s SENSEABLE CITY LAB and uses two, Kuka 6-Axis robots and their app to replicate the bartender experience. MakrShakr can create 60 types of spirits at rates up to 120 drinks per hour. Customers order their drink from the MakrShakr app and have the robots prepare it to millilitre precision. 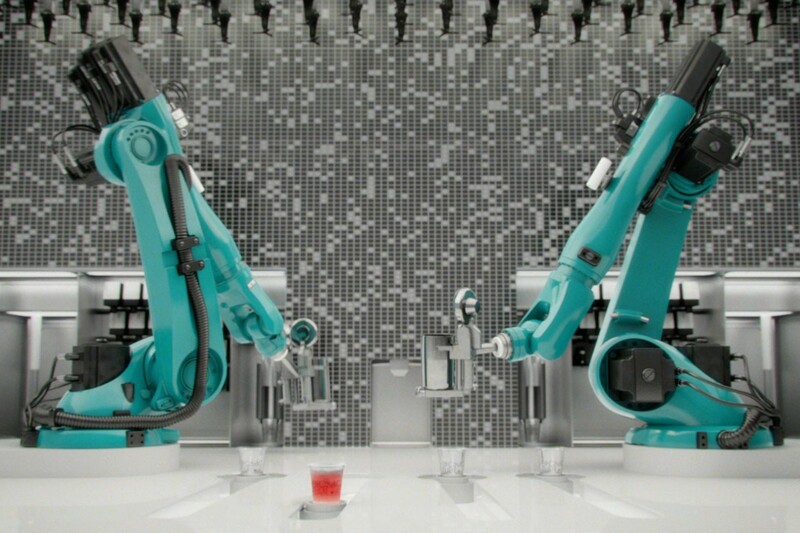 Imagine a robot bartender cutting you off at the tech conference because your BAC is too high. How Can Robot Manufacturers Respond? Industrial robot manufacturers need to quickly realize these upcoming trends and adjust their strategies as well. You cannot predict how customers will use your product. Not everyone can raise enough money to lay down $60,000+ for a robot that’s difficult to customize, both physically and digitally. Robot manufacturers risk over serving a new segment in some ways and under serving it in others. How are you helping this new customer segment offset the upfront cost? Can we offer lower end, more easily customizable models? Are we meeting the customer’s data needs and how could they package the data to generate revenue? If robot manufacturers fail to move on this emerging trend quickly, others will jump in to fill the void. What 6-Axis Robots Have You Seen In the Wild? I only covered a few examples of how these robots are popping up in the food and beverage industry. Do you have a favorite example I did not cover? Please drop them in the responses below. 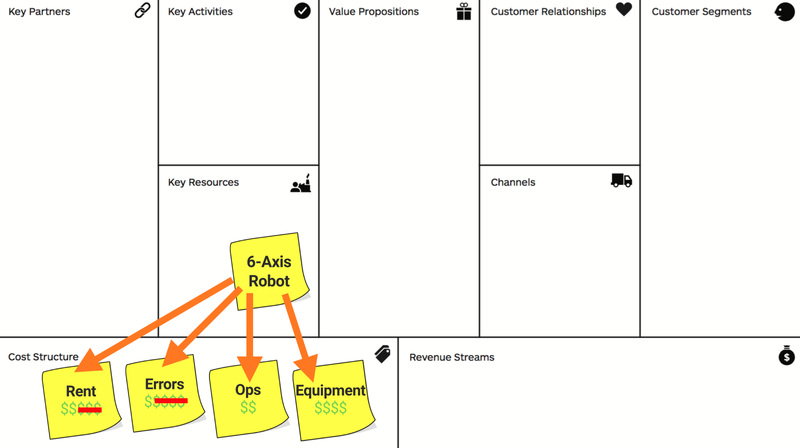 If you would like to learn more about how I approach these questions with corporations, visit the Precoil library where you can access free lean startup and design thinking tools, templates and videos.